Sick of dual-stick shooters? Gunning down spaceships lost its shine? I hear that. 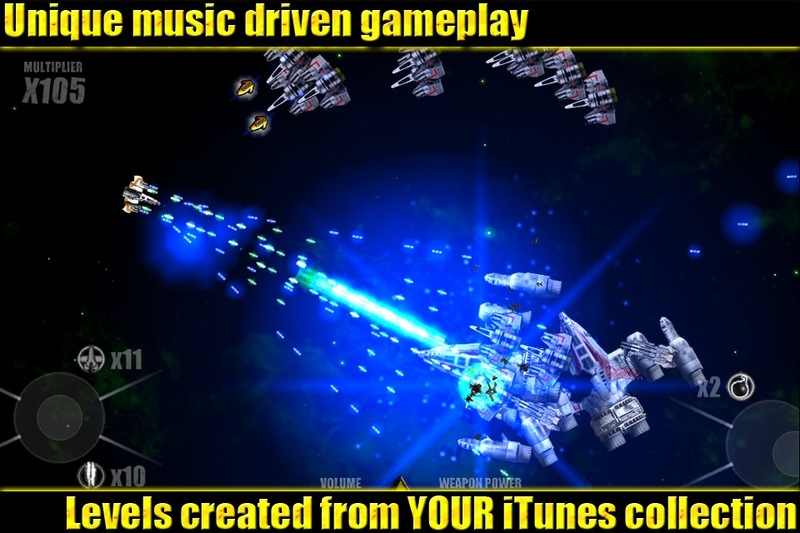 But let me just say this: unless you’re really, truly, and utterly sick of the genre, you really shouldn’t miss Beat Hazard Ultra [$0.99], an outstanding music-generated shooter from Cold Beam Games. It has a few problems – awkward menus, fiddly controls, limited music sources – but I can’t think of a more compelling reason to grab a pair of virtual sticks and let the bullets fly. This version is just about on par with its PC and PSN counterparts for a fraction of the price. There’s no better way to light up your screen with insane strobes of gorgeous color. Just mind the photosensitive seizure warning, because it’s not kidding around. 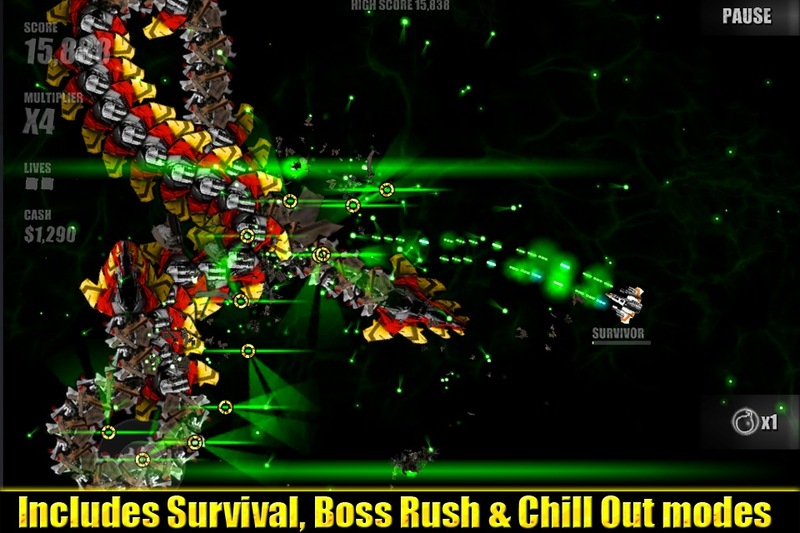 If you haven’t played the desktop or console versions, Beat Hazard Ultra might seem to stand out uncomfortably in the realm of dual stick shooters. There aren’t really any levels, the enemies don’t sport much variety, your ship isn’t at all interesting to look at—not a great package by traditional metrics. But the game’s beat detection and intense visuals easily make up for those deficiencies. The soundtrack is your iTunes library (specifically your .mp3 files), a few included Internet radio stations or a handful of baked in tracks. If you can, bring in your own music—it makes the game so much more fun. Each time you play, the game builds a level around your song of choice. The music is monitored on three levels—the energy of a particular movement or verse decides the boss encounters and enemy waves that will appear, the beat creates the pulse and intensity of your weapons fire, and everything in between controls enemy numbers and movement and shot patterns. Because this works so well, it’s hard to care that you’ll be seeing the same few enemy types and the same handful of bosses over and over again. Or possibly not seeing them—you can crank the intensity of the visuals up to 200%, and at max firepower you’ll hardly see what’s happening as your screen pulses with light and color. The intense visuals pulsing in time with your favorite tracks is something to experience. The controls make this a little harder than it needs to be. There are several power-ups you can collect and use in Beat Hazard Ultra, bombs and homing missiles and the like, but the way they cluster around the joysticks on screen makes it kind of hard to trigger them. Single-stick modes avoids this, but it’s too uncontrollable for practical use. The floating joysticks are also an exercise in frustration—choose the fixed option for more control. For some of us, even the menus are weirdly awkward. If that describes you, then drag them, don’t tap them. While I can manage higher scores and longer runs on other platforms, this version is just as fun. Running through songs, collecting multipliers and cash, and blowing up ships for high scores could get old, I suppose. Then you can switch to Survival or Boss Rush to change your focus, and increase the difficulty up to five steps from Easy to Suicidal. I’ve still got a long way to go to be able to survive a track on Suicidal, but the journey is worth it. You want to be well rewarded for your time? 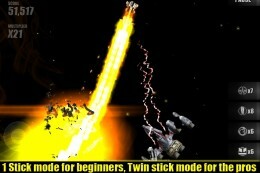 Play on a high difficulty in a long-running mode. You’ll watch the experience bar fly up when you’re done, levelling you over and over. Each time you finish a run and level at least once you get to unlock a perk of your choice from a huge list. 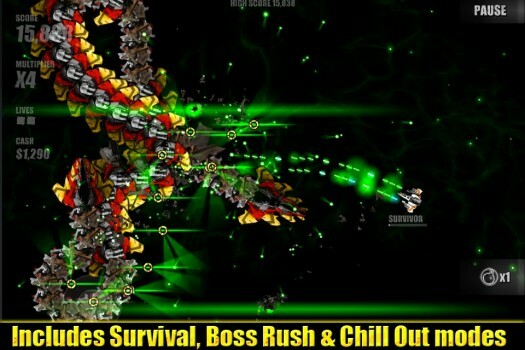 They focus on aggression, power-ups, scores or endurance, and you can upgrade each of them with virtual cash as you go. There’s strategy here: you can only equip a few perks even after you unlock the one that gives extra slots, so you have to choose them carefully before each attempt. You might also want to curate your music collection carefully. I have no complaints about how the game handles its beat detection—it isn’t always obvious, but the changes between different songs are considerable (and consistent through replays). I do wish, however, that Beat Hazard Ultra was a bit more intelligent about managing play order. When you set up the game you can choose a particular song from a full list of your library, or you can play a random track. The non-standard modes go on for longer than a single song, though, and there’s no way to choose what will play after the first. Thankfully, Beat Hazard Ultra is still fun with slow tracks. The best are the ones that vary their beats, since those are the levels that really get wild. Hard thumping bass might be more intense, but it can also get a little repetitive. My white whale is Girl Talk’s All Day – I figure I can top the Game Center leaderboard for songs 7 minutes and up if I can just master the full hour and eleven minutes of it. Unrealistic, maybe, but I’ll keep trying. I’m racking up a lot of achievements on the way. I can’t think of many reasons anyone should pass this game up. If you truly loathe dual-stick shooters, there’s no escaping that Beat Hazard Ultra falls in that genre. If you hate music you should probably pass, and if you’re badly affected by full-screen strobing lights you’ll want to stay far, far away. Otherwise, it’s a heck of a game, gorgeous, challenging and long-lived in turn. I’ve hardly been able to put it down, and listening to music without the game just doesn’t feel as cool right now. Let us know what you think on the forums, but don’t miss this one. Your eyes deserve a little excitement, don’t you think?